We’re three weeks into the New Year and many of you are already frustrated with your New Year’s resolutions and recoiling in horror from that muffin top spilling over your jeans! Focus on waist, not weight. What’s too much? Get a measuring tape, wrap it around your waist, and check your girth. Do it while you’re standing up, and make sure the tape measure is level. Anything more than35 inches (if you’re a woman) and more than 40 inches (if you’re a man) indicates insulin resistance. Numerous hormones contribute to belly fat, but if you want to place the blame for your muffin top on one out-of-whack hormone, all fingers point to insulin which literally signals your body to deposit more fat around your belly. Cortisol (main stress hormone) is equally to blame as too much stress makes you fat, especially at your belly where fat cells have 4 times more cortisol receptors than fat cells anywhere else. And the more stressed out you are, the more you’ll crave sugar (cortisol is a glucocorticoid and one of its main jobs is to to raise blood sugar). And if you’re reading this, you’re all too familiar with the vicious cycle of stress, cravings, weight gain (with a muffin top that won’t budge), guilt, loathing, rinse and repeat, right? 1) Stamp out Sugars – in all of its forms. Especially liquid calories from any source (soda, juice, alcohol) all of which store belly fat. 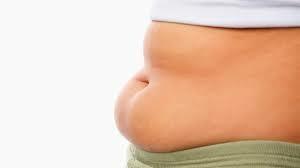 Be on a mission to get high fructose corn syrup out of your diet as it is especially good at laying down belly fat. Build your meals around non-starchy veggies, clean protein and good fats so you are literally too full for dessert (including fruit). Fruit is not a free food; for instance today’s apples have been hybridized by Big Agriculture to be large sugar bombs often containing 20 grams or more of fructose which is the most metabolically damaging sugar. So just remember: Carbohydrates = Sugar = Insulin = Fat Storage. By loading up on non-starchy veggies at each meal, you are creating the hormone signaling to increase insulin sensitivity and thereby your resilience to stress which will deflate that muffin top once and for all! 2) Figure out Food Sensitivities. Ever find yourself uncontrollably eating a box of Wheat Thins or reaching for a second slice of buttered toast? Ironically, the foods you’re most reactive to are the ones you crave the most. According to Dr. Daniel Kalish, your body reacts to intolerant foods by creating addictive narcotics called opioid endorphins. Like a drug, you have a feeling of euphoria when you eat these foods, and subsequently crave them. The two foods that make losing belly fat the most challenging in my practice are gluten and dairy. But corn, soy, peanuts and artificial sweeteners are also potential offenders. So, I teach my clients how to eliminate these systematically and while it’s not easy, the payoffs are massive with shrinking belly fat, reduced cravings, less brain fog and radiant skin sans rashes/hypersensitivity. Now many of my clients think whole grain wheat is a “health” food. But Newsflash: 2 slices of whole wheat bread will spike your blood sugar HIGHER than 6 teaspoons of refined sugar! Modern day, hybridized wheat is a far cry from the wheat consumed by our ancestors and has a changed amino acid structure in the protein gliadin which is indigestable and triggers intestinal permeability aka leaky gut which is the first step in trigerring autoimmune disease. 3) Burn Baby Burn (Fat, not Sugar). You will successfuly transition from being a sugar burner to a fat burner as you cut out sugars and clean, lean protein and good fats take center stage in your diet. So you’ll burn a steady, high-energy ﬂame all day long. You’ll even burn fat while you’re sleeping! Becoming a fat burner is your secret weapon against cravings and sustainable fat loss. So how do you do this? The most powerful way is by swapping your sugary cereal with a protein powered breakfast within one hour of waking. I usually recommend a low glycemic smoothie with a couple of tablespoons each of flax, chia and hemp seeds. Another option is to scramble up some organic, pastured eggs in ghee with your favorite veggies. 4) Ch-Ch-Ch- Chia your way to a smaller waistline. These nutritious little seeds are great for fat loss, because they help stabilize blood sugar and improve your insulin sensitivity which can lead to fat loss. Chia is also rich in Omega-3 fats, and the seeds are filling because they contain loads of fiber. Try a few tablespoons of chia in unsweetened almond milk with some vanilla and stevia for a delicious and filling protein shake. 5) Catch the Curve (so you don’t lose when you snooze). Every single hormone we produce is synced up to the natural bio-circadian rhythms that exist in nature establishing biochemical peaks and valleys, similar to how a flower opens and closes during a 24-hour cycle. So you get a burst of cortisol upon waking (called the CAR or cortisol awakening response) and then it should be a gentle downhill slope being its lowest at night around 10-11 pm. So you want to catch the curve when cortisol is at its lowest, but if you’re banging out emails or socializing on Facebook then you catch that 2nd wind which is no good. This creates that tired but wired feeling that leads to compromised sleep. And there’s probably nothing that will help your stress response and belly fat more than making fabulous and reparative sleep a top priority. Learn more by scheduling a complimentary 30-minute Belly Blasting Breakthrough health consultation and together we’ll customize a plan to help you achieve a trimmer waistline.